What is The Memory Store? Remember those photo booths where you would sit with a friend, pose, and then leave with a few photos? The Memory Booth is like that! You come, sit down, have a chat, and you leave with a memento - a recording of your story that you can share with family and friends. We can mail you a CD, or we can email you a copy of the recording, whichever is easiest for you! The Petty Harbour-Maddox Cove museum will also get a copy, to preserve the stories of the community. Come and sit down in our recording booth, we’ll give you a list of questions to read, and away you go! We handle the recording part. Nothing! 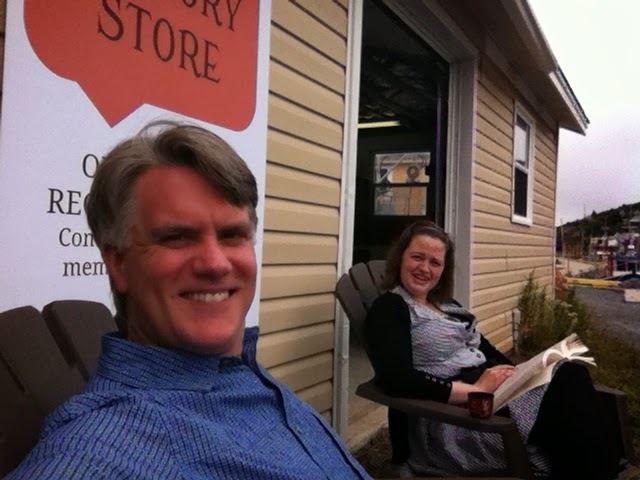 The Memory Store is part of the Petty Harbour-Maddox Cove 6th Annual Arts and Heritage Festival, and is absolutely free. Do I need to bring a friend or family member? It’s more personal if you bring a friend or family member to interview, but if you want to come on your own, we’d be happy to sit with you and have a chat. The Memory Store will be in the yellow shed, right on the harbourfront, three buildings up from the convenience store (Sam Lee’s old shed). You should allow yourself about half an hour for the conversation. Is it just about Petty Harbour? All memories are welcome! If you grew up somewhere else, let us know! The Memory Store will be open from 11am to 4pm until Sunday August 17.